Valentines Day is what my husband and I like to refer to as the Hallmark Holiday. We are not huge celebrate-ors of flowers being priced twice as high as their normal cost and all the high pressure to show the one you love that you care. 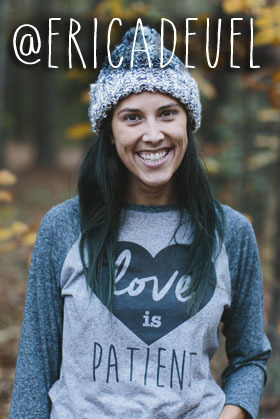 We come from the belief that should happen ALL the time, all 365 days of the year. Random flowers bought, special notes left, and taking out the trash mean more to me when it is not forced upon. Can you relate or is Valentines Day something special to you? Although we are not HUGE Valentines Day people, we do have small kids who love holidays and get really excited about new decorations going up. 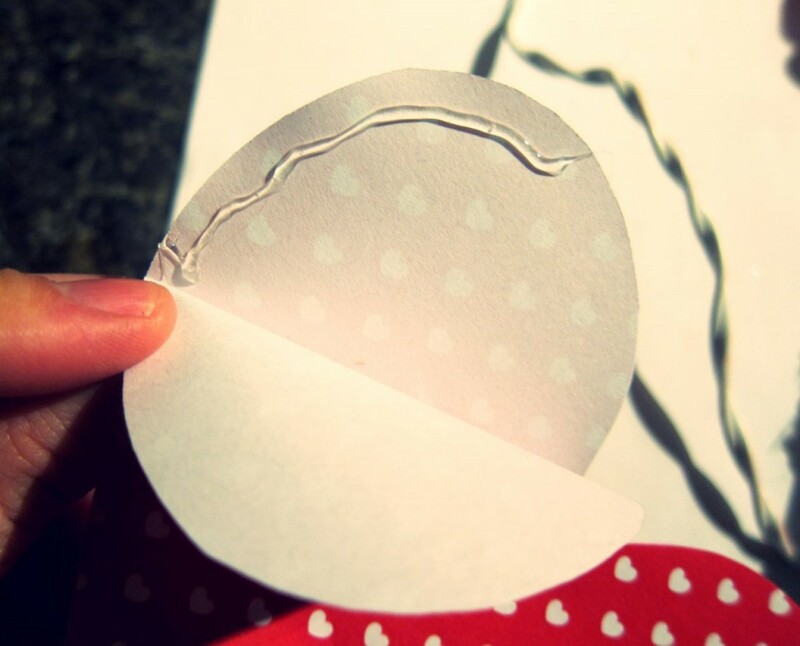 So, as a mom and DIY/homeschool blogger I feel to let the holiday go by without doing some special crafts and mentioning them would be a no-no. This week, I decorated our fireplace mantel from different things we had around our house or cheaply bought/made. 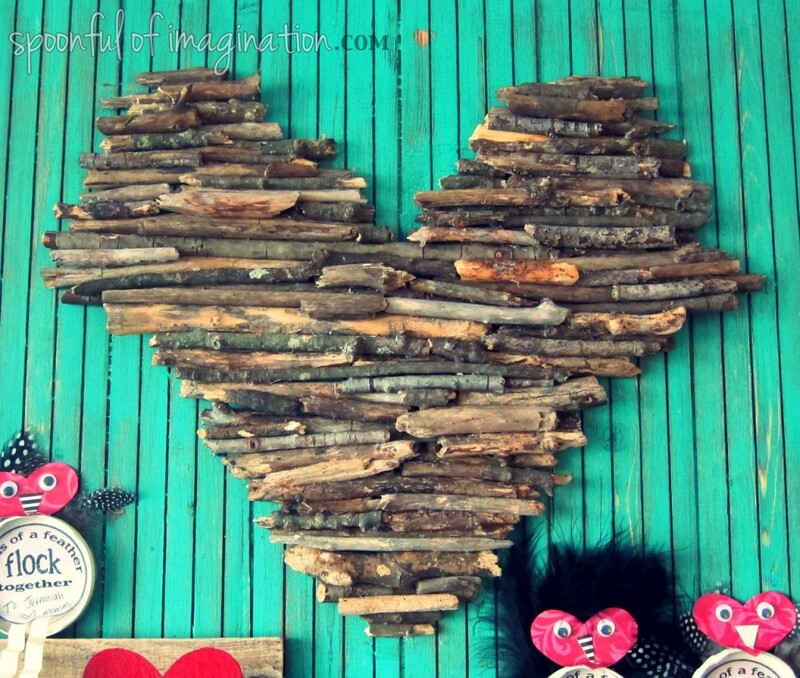 I am going to break it down for you, show you a quick DIY, and I have a SWEET tease at the end. 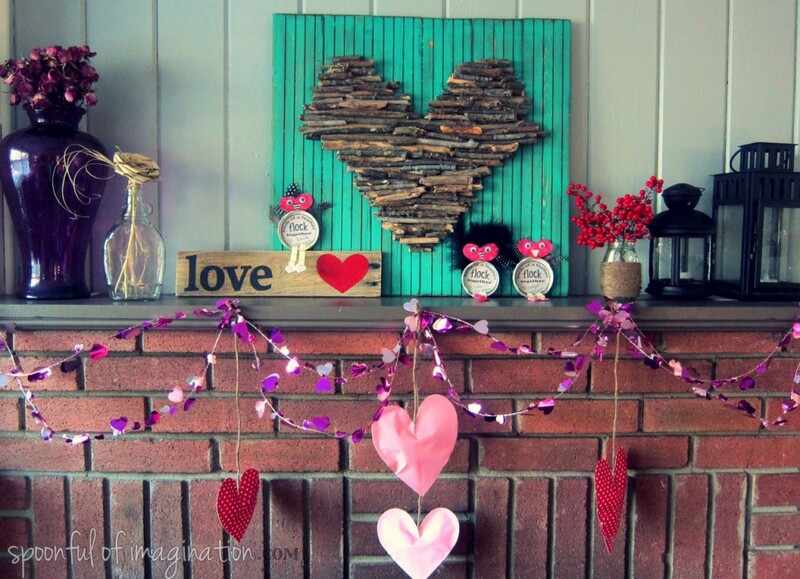 You might remember my Stick Heart Wall Art, in which I showed you how to make the focal point of my mantel. Since I posted the original pictures of this wall art, I have been gathering more sticks and filling in all the gaped holes. I like it so much better than what it use to be. Although, it is not quite done. Next, I left my Ikea lanterns in place and started adding other thing to it. I grabbed the huge purple vase out of Reagan’s room with dried roses. I added this old maple syrup bottle in which I stuck in my straw flower I picked up on my Savannah’s girl trip last year. I wrapped twine around a honey jar I bought (and ate) at the Country Living Fair last fall and stuck some red berries in it that I cut off a bush in my backyard. 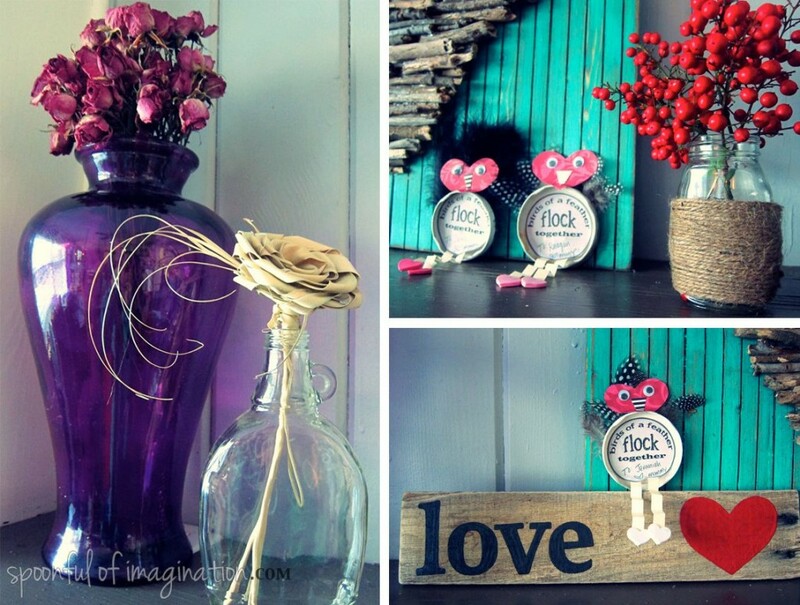 I still love my little Bird’s of a Feather Valentines I made for my kids from old spaghetti jar lids, so of course they had to be up there. 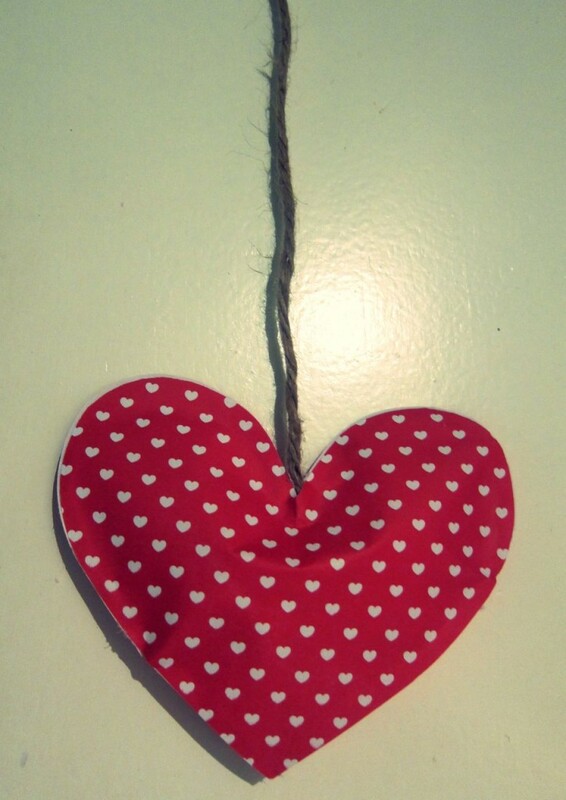 The little love wood sign is not quite complete either, but it is on loan for my mantel. Once I finish it, it will be a part of a fun group giveaway (that I will be sure to let you all know about). 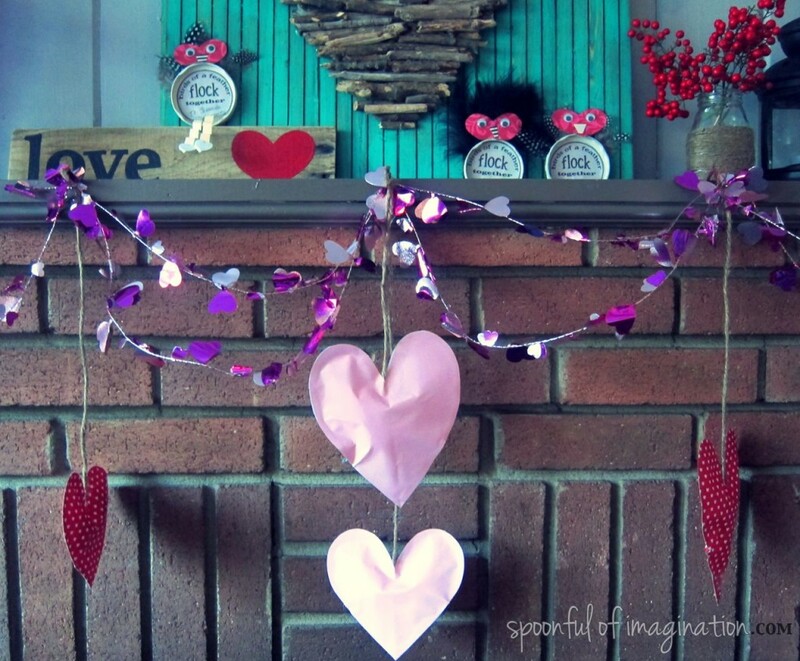 Lastly, I draped some fun heart garland that I bought at the Dollar Tree and made some fun 3d paper hearts that I hung from it. 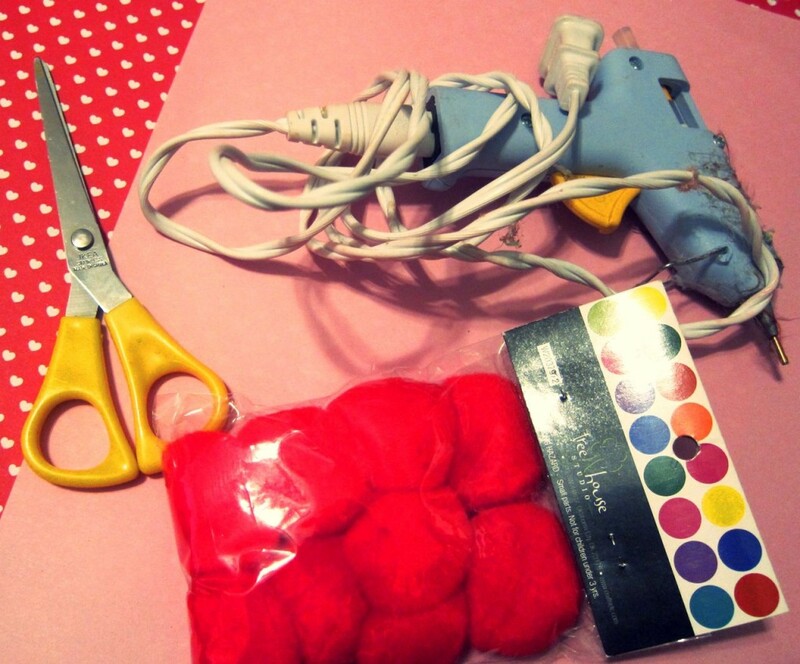 I originally was going to sew some felt hearts and stuff them with Poly Fil, but I decided that I didn’t want to spend the time to make such a temporary decor item. This was my substitute creation. Fold your paper in half (I used 12″ x 12″ sheets) and then fold it in half again. 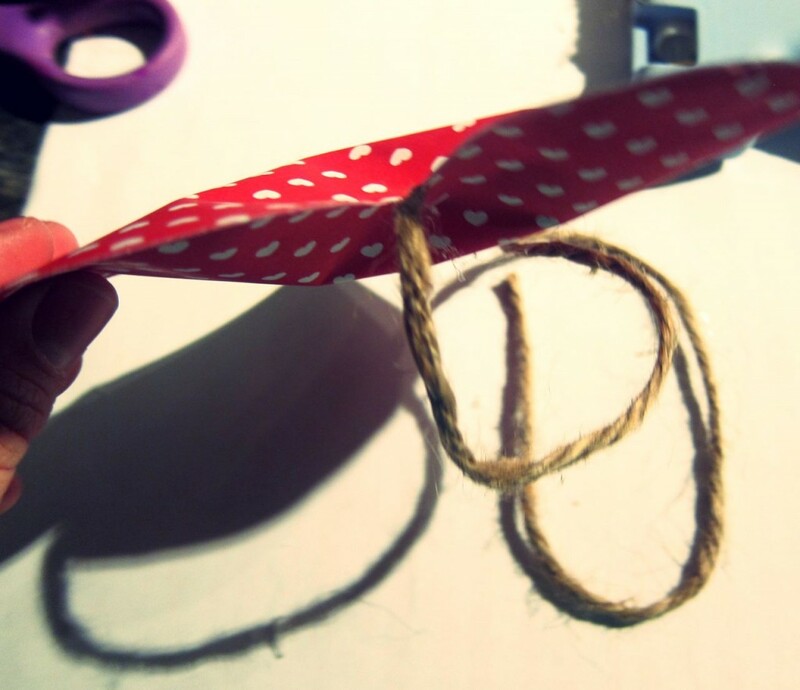 By doing this “double fold” you will be able to cut out two hearts the same size. Cut as many double hearts out you want. 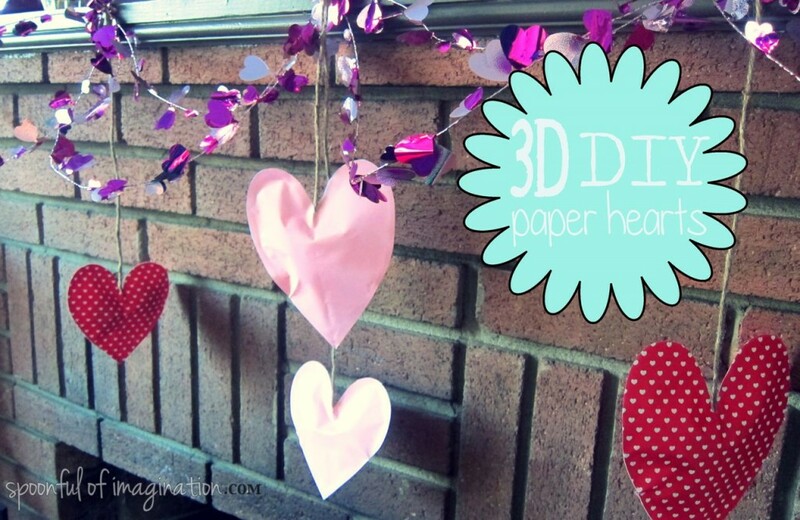 I created four 3D hearts, so I had eight paper hearts cut out. 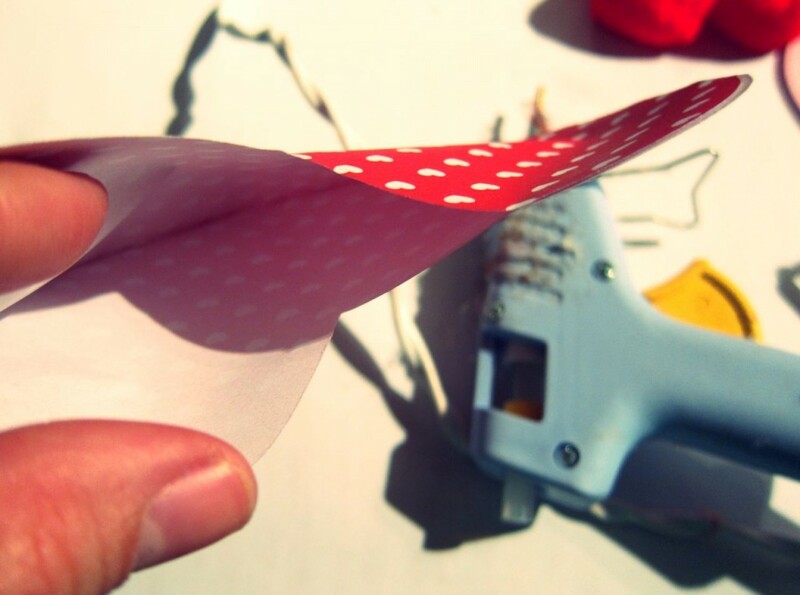 Once you have cut out your hearts, start gluing them together, but leave a gap open at the top. 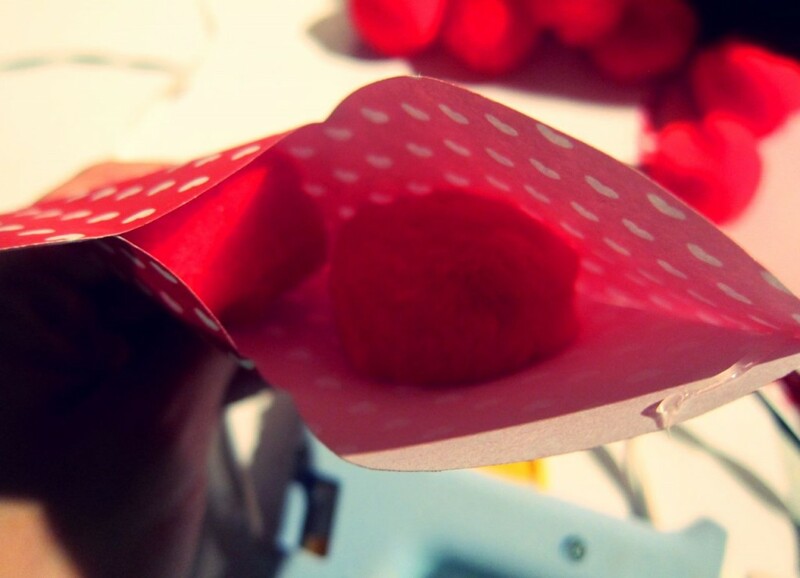 It will feel like you have a heart envelope. 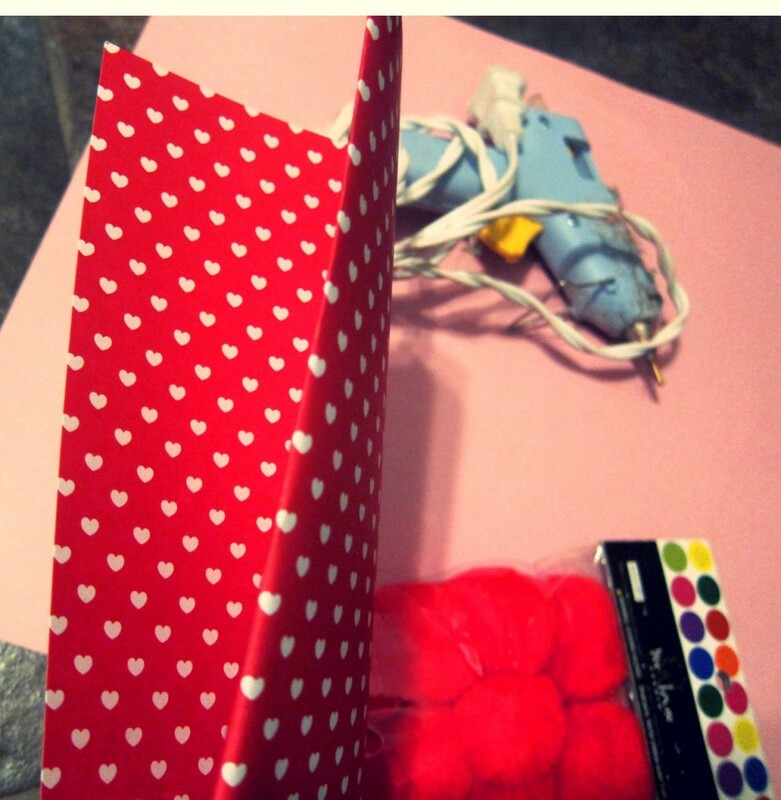 Stuff a few pom-poms (the size of your pom-pom & hearts will depict how many pom-poms you stuff) inside. 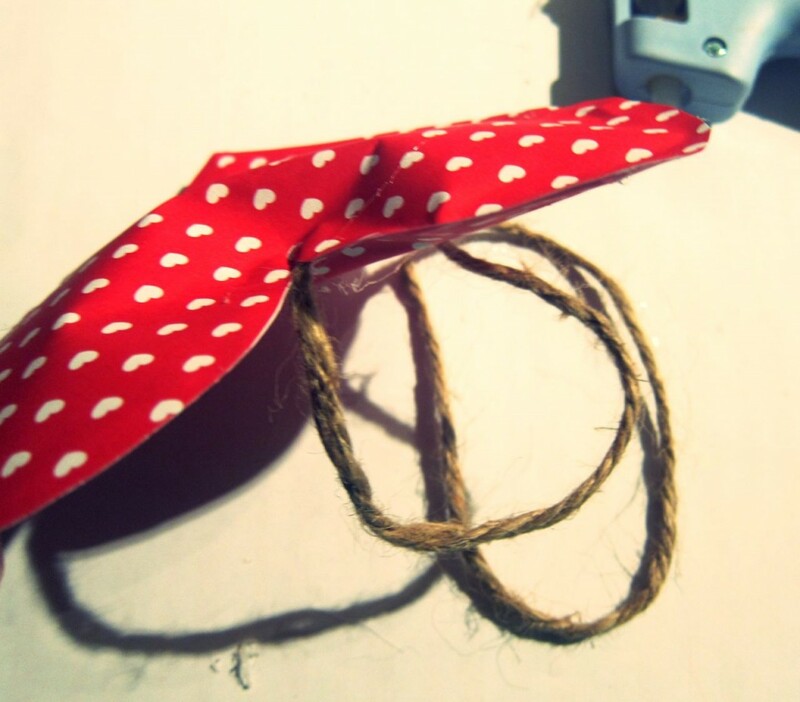 Add a little hot glue, and stick the jute twine (cut the desired length for you) on it and glue your heart shut. Just complete that process till all your hearts are done! I think they came out really cute! 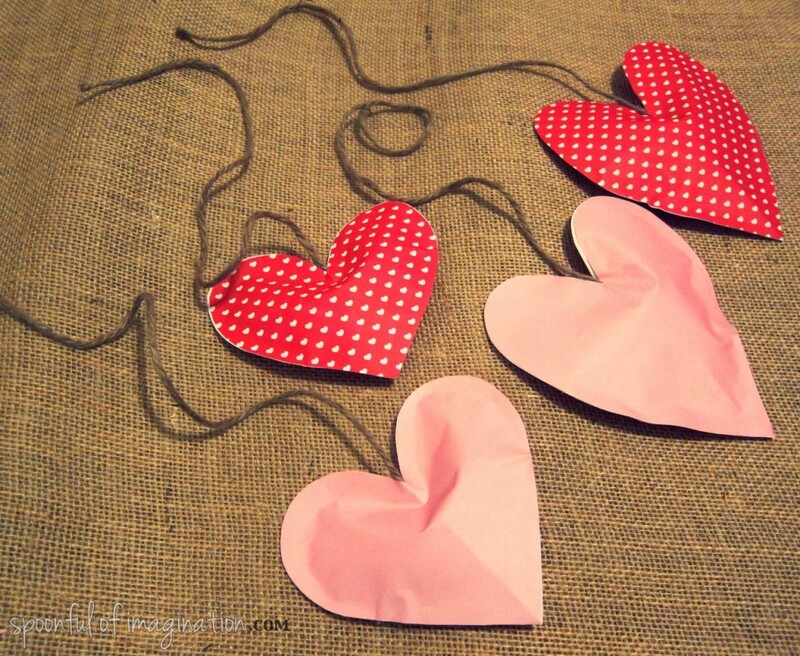 They were so much quicker than sewing felt hearts. When Valentines Day is over I’m going to let my boys rip them open and take out the pom-poms. They will love it! So, what do you think? 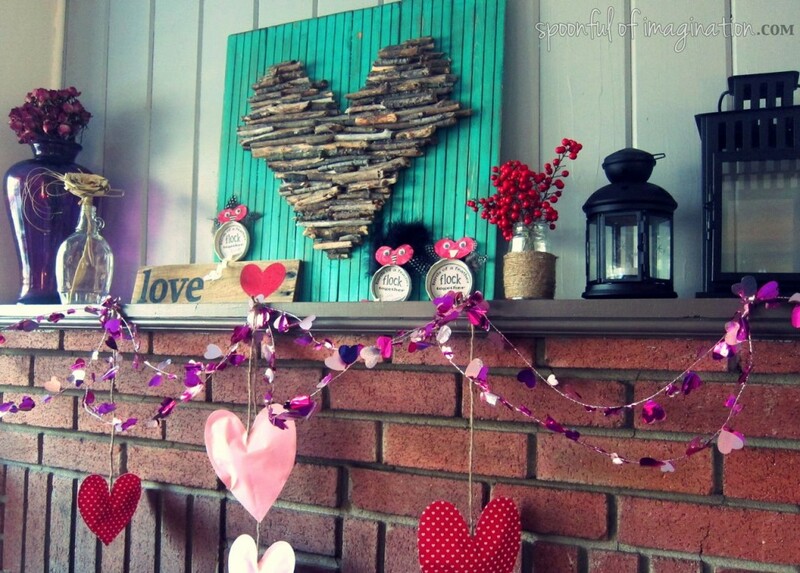 Do you decorate for Valentines Day? How will you celebrate the day? Now for my little tease! There was a whole scene and plan my kids were scheming up behind my mantel photo shoot that I can not wait to show you with lots of pictures and a VIDEO-coming this weekend! Stay tuned! Hahahaha I can’t wait to see the video!!! Those little creative rascals. 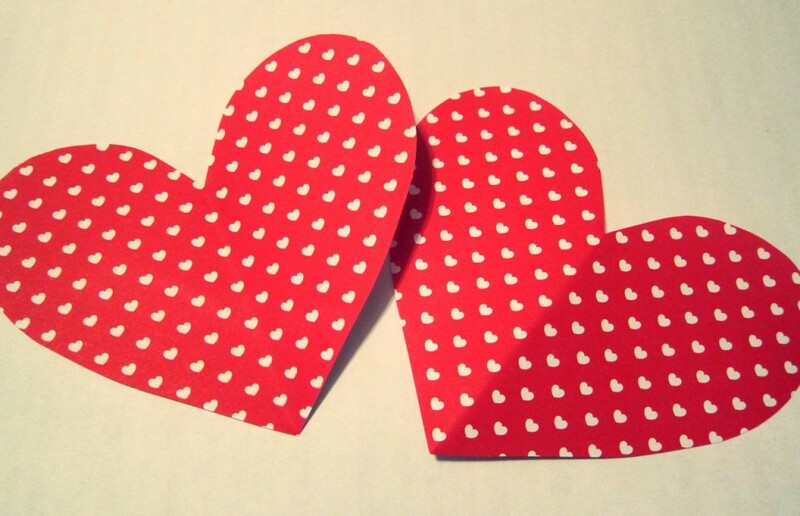 Love the 3D hearts! They add so much!!! Love all of this and you. The end. hahaha Thanks Maddie! We love you too! The video is a little later than the weekend, but it now up. Please laugh and cry…and cone visit us!!! I like it! As far as Valentine’s Day, it’s my birthday, and while I don’t enjoy how commercial/forced it can be, my mom sent me something special to school which I loved and I’ve never forgotten how special her love and thoughtful gifts made me feel on a day most people dislike (b/c they feel forced to show love in a commercial/generic way, not because I was born on that day, at least that what my momma said ;)).